The new body has soft bust and torso, the latter I didn’t know about so it was a surprise. My only concern with soft rubber parts is sometime they tend get stained by dark clothing easier. 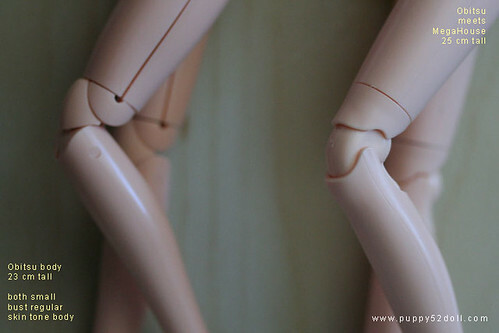 But that hasn’t happen yet — I rarely put dark clothing on my dolls. My older obitsu body came with a bald head, some neck parts which I never use, and some spare hands, the new body comes with a couple neck parts and a few hands as well. I think the older type of body these days do not come with the head anymore — from my most recent search on ebay. Different elbow joints – the new joint is easier to bend for elbows, but for knee it’s a bit harder to bend to desired positions. 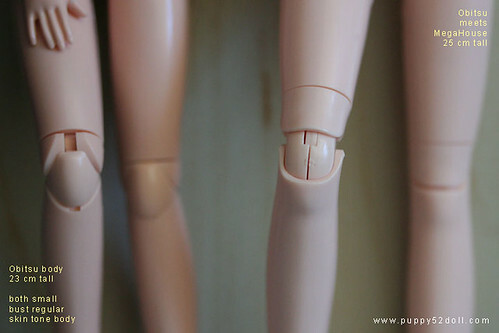 Side of knee joints – I noticed that the older body has more visible seamlines compared to the new one. 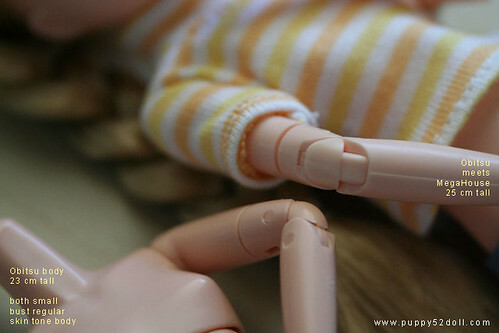 Hopefully this entry is for some help for people who are considering to get obitsu body for their dolls. Thanks for reading! Wow, I’m still new to the different types of dolls so this is interesting for me to see. It’s really pretty as well!